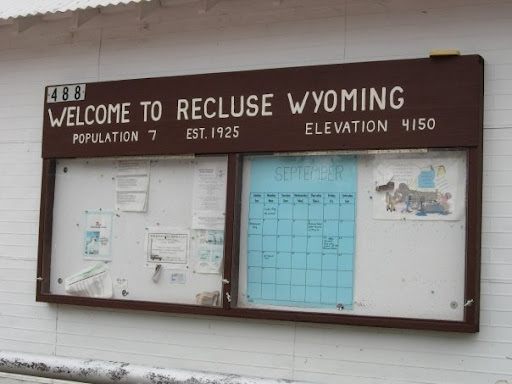 I was the second customer of the day at the Recluse, Wyoming post office. At a distance of 22.5 miles Arvada, population 33, is the closest town. (Though Gillette, a city of 20,000, lies just 36 miles to the south.) Recluse? Well, see for yourself! The post office and the school serve ranchers for miles around, of course. The Wyoming Tourism website even reports that the town was so named due to "the distances between area ranches and the post office"! I visited several obscure, though friendly, offices that day. The tiniest was Leiter, Wyoming -- the 'town' essentially consisted of one long building at a crossroads, and the post office is only open from 8 to noon. I had to mail back for its postmark later. Arvada, Wyoming. Another relatively new building. Alas, the title's a pun -- only one of these offices is in Brooklyn. 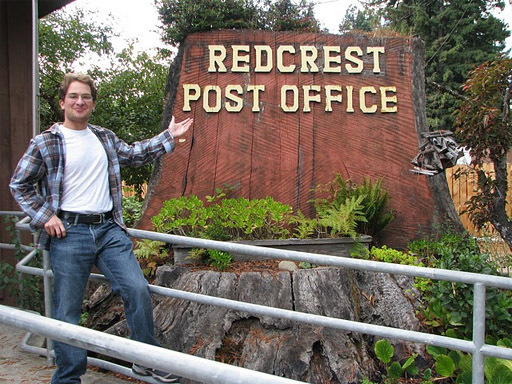 The author by a sign for the Redcrest, CA post office. Middle of redwood country; 2008. Of course there's also Orange, NJ and White Plains, NY. Can we round out the rest of the spectrum? Say Silver City, NV; Blue Hill, NE; Golden, CO; Black Earth, WI; and Brown U. Station, Providence, RI. There are dozens for the major colors -- consider Green Bay, Greensboro and Greenville -- so let's try to be more subtle. Though maybe not as subtle as Olive Hill, TN. There's got to be a sweet spot. Are there any post offices out there with Violet or Purple in it? Hawai'i might not be a U.S. state today if not for its sugar industry. By the late 1800s, sugar plantation owners had gained enough influence over the islands' economy that they helped to overthrow the royal family of the islands (who lived in the stately 'Iolani Palace), in favor of annexation to the U.S. It was just that much easier to secure a market for their products this way! How much product? As recently as 1960, Hawai'ian sugar brought in a[n inflation-adjusted] billion dollars to the local economy per year. Production peaked at over a million tons a year. The Big Island's northeast coast was a hotbed of plantations, and even featured a sugar train that ran down to Hilo. There is much less activity along that shore now, but one nugget lies in the town of Nīnole: the state's smallest post office! In the second photograph you can see the PO boxes for the residents of the town, as there's no delivery in Nīnole. Note something you'd never see on the mainland -- the lobbies is open-air! Meaning you don't have to go inside to pick up your mail when you get home and the office is closed. Many offices in Hawai'i, even in Honolulu, have open-air box (and a couple, even retail) sections. I suppose that's what you get when the temperature rarely dips below 70. Here's the largest office on the island: Hilo's; 17 miles down the road. Since mid-2008 I've visited 1,250 post offices, in the quest for postmarks to collect and document the location and date of my travels across the country. More information about the hobby can be found at postmarks.org. I thought it would be nice to share some of the more interesting and obscure places I've experienced! All photos and text are my own; all rights reserved.